Nearly every survey conducted over the past decade by or for the Thoroughbred industry elicited comments about the need for a national racing office. The consensus opinion is that racing cannot grow without a central office coordinating marketing and promotional efforts. This same national commission, if ever formed, would also improve racing’s reputation by shepherding standardized medication use policies, testing, and enforcement. Three months ago The Blood-Horse began looking into the feasibility of ever creating such an organization. Pennsylvania freelance writer Evan Pattak tackled the existing legal obstacles with creating a national office, while news editor Tom LaMarra looked at the history of past attempts. The package of stories on the following pages paints a definitive picture of how realistic a national office is and where the industry going forward needs to focus its energies. It even provides a glimpse into proposed changes that may make a real difference. The timing couldn’t be better for the industry to aggressively pursue a realistic path toward national unity, with or without a national office. 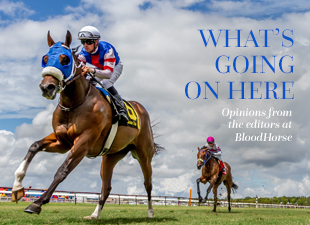 The New York Times did its part to stoke a fire under the medication issues the industry has been talking and talking and talking about for years by launching a series of scathing articles about horse racing March 25. The first part in the series looked at lax medication testing and enforcement policies and the toll these shortcomings have had on the lives of horses and riders. Let’s hope all the sound and fury lends traction to the changes being proposed and the outcome is real and permanent reform. The Bluegrass Conservancy experienced its own tectonic shift last week when Claiborne Farm donated nearly its entire landholdings to the Central Kentucky non-profit land trust. “No question about it, this is a record-breaker and a game-changer for this organization,” said Mackenzie Royce, executive director for the Bluegrass Conservancy, which now holds in trust the conservation easements for 17,215 acres. The farm near Paris, Ky., has been owned and operated by the Hancock family for more than 100 years. Claiborne was founded in 1910 by Arthur Boyd Hancock and is now run by his grandchildren Seth, Dell, and Clay Hancock. Being groomed to take over the family business are Seth’s children Walker and Allison. No money changes hands with the conservancy. The landowner donates a conservation easement that remains permanently with the land and prohibits future commercial development. The objective of the Bluegrass Conservancy is to knit together a critical mass of contiguous acres, similar to what has been accomplished in Brandywine Valley in southeastern Pennsylvania and northern Delaware. The conservancy group there has secured more than 430 conservation easements protecting more than 44,000 acres. The goal in the Brandywine Valley is the same as it is in Central Kentucky’s Bluegrass region: to protect the cultural, natural, and scenic quality of the land. The Hancocks’ decision also protects an important piece of American Thoroughbred racing history. Claiborne has produced 75 champions and stood 10 stallions that topped leading sire rankings, most of them multiple times, such as Danzig, Mr. Prospector, Round Table, and Bold Ruler. The farm is where Secretariat stood and is now laid to rest. In contrast, the future of Meadow Farm—the birthplace of Secretariat in Virginia—is up in the air. The State Fair of Virginia hoped to purchase the property but its offer was rejected. The not-for-profit organization is currently in bankruptcy. Thankfully these are issues the Hancocks won’t lose sleep over regarding their picturesque corner of Bourbon County.